LOCATION.--Lat 42°52'34.6", long 74°36'10.3" referenced to North American Datum of 1983, Montgomery County, NY, Hydrologic Unit 02020004, on right bank 10 ft upstream from bridge on McEwan Road, and 2.3 mi southwest of Canajoharie. PERIOD OF RECORD.--March 1993 to current year. REVISIONS HISTORY.--Gage height for the period Aug. 16, 2017 to Sept. 30, 2017, was revised on May 8, 2017, based on changes to the sensor location. Discharge for the period of Aug. 7, 2017 to Sept. 30, 2017, was revised on May 8, 2017, based on changes to the stage-discharge rating. GAGE.--Water-stage recorder and crest-stage gage. 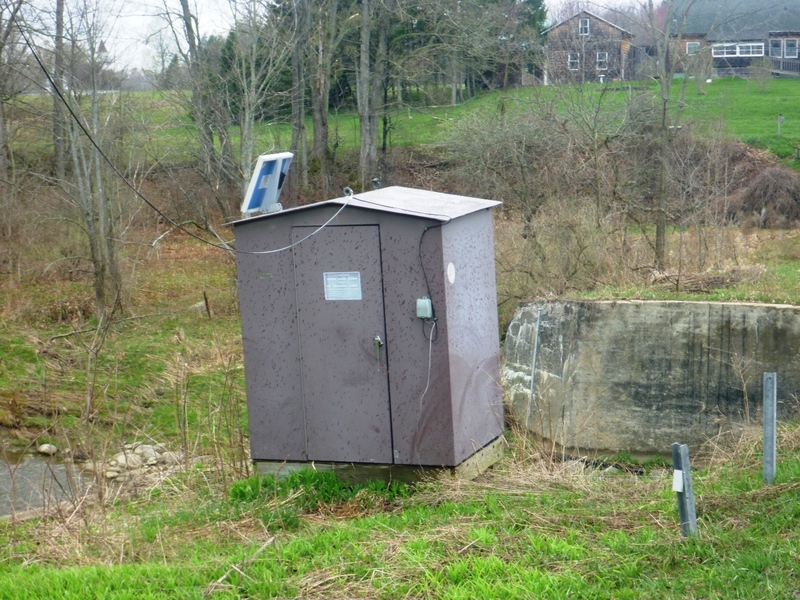 Datum of gage is 635.23 ft above NAVD of 1988. Apr. 27, 2016 to Aug. 16, 2017, at temporary site 110 ft downstream at present datum during period of bridge reconstruction. EXTREMES FOR PERIOD OF RECORD.--Maximum discharge, 5,850 ft³/s, Aug. 28, 2011, gage height, 10.76 ft; minimum discharge, 0.23 ft³/s, Aug. 27, 28, 29, 1995, gage height, 1.26 ft; minimum gage height, 1.21 ft, Sept. 10, 2015. PERIOD OF DAILY RECORD1.--WATER TEMPERATURE: March 1993 to September 2000. EXTREMES FOR PERIOD OF DAILY RECORD1.--WATER TEMPERATURE: Maximum, 37.0°C, July 15, 1995; minimum, 0.0°C on many days during winter periods.